« Northeast Colorado moves to secede! 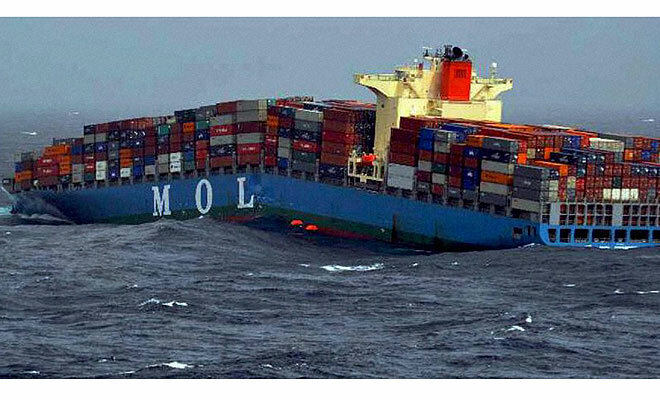 It has been confirmed that the ship featured in numerous internet memes is the Japanese made MOL-Comfort. The ship’s hull cracked in two on June 19th during severe weather. While the ship did not actually sink, some shipping containers were damaged or set adrift. These floating containers represent serious obstacles for other vessels. Both pieces of the ship are still adrift. A salvage company is attempting to rescue the damaged vessel. The ship is registered to the Bahamas and was sailing from Singapore to Saudi Arabia. The damage occurred off of the coast of Yemen. The cargo ship has six sister ships of the same design. Social media is full of claims that the ship was carrying arms to Syrian Jihadists. However this can not be confirmed. This entry was posted on Tuesday, June 25th, 2013 at 8:27 pm and is filed under Middle East. You can follow any responses to this entry through the RSS 2.0 feed.